This luxurious kitchen and master suite were completed in the Fishweir Creek area and brought a much-needed update to the home. The kitchen feature hardwood floors, granite countertops, stylish island, and tile backsplash. A built-in wind rack under the microwave offers an elegant storage solution to a favorite pastime! This immaculate kitchen and dining room remodel was completed in the Mandarin area. The beautiful dining room table and bench that can comfortably sit 10, was built and stained by Sport Nobles Construction. This kitchen remodel, that was completed in a 1927 Avondale home, added a kitchen that helped to bring a needed updated feel to the home. The stainless-steel appliances and dark countertops contrast very well with the traditional white cabinets. The large kitchen island adds counter top space and provides an excellent area for the family to gather! This home located on the Ortega River, received a much-needed kitchen remodel and update to their living area. The traditional white cabinets work well with the hardwood floors, while the large kitchen island helps to provide an ample amount counter space. This home is located in Ponte Vedra, equidistant between the Intracoastal Waterway and the beach. This magnificent kitchen remodel boasts traditional white cabinets, that are offset with simple black countertops. It also has extensive tile work on the walls and comes complete with stylish stainless steel appliances. 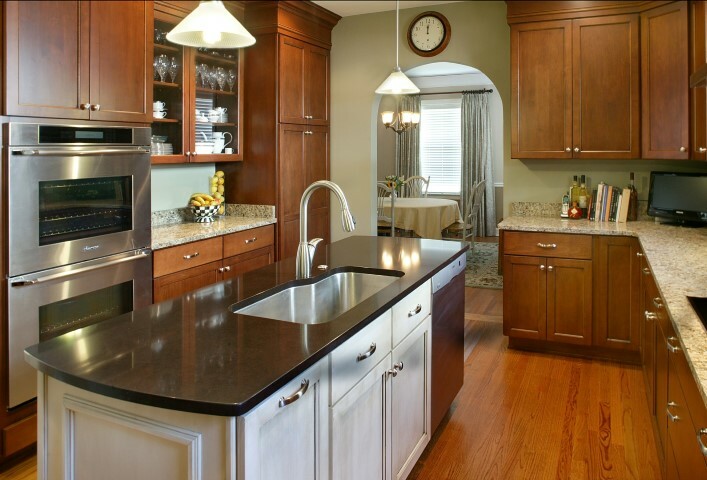 This Avondale kitchen remodel was completed in a 1929 historic home. New wood floors and custom white cabinets gave it a traditional feel, while the new pendants and stainless steel appliances give a modern look. Together, with the white cabinets and new windows, the brightness of this kitchen is very inviting. This stunning complete kitchen remodel is located in Ponte Vedra Beach. The overall size of the original kitchen was the chief complaint for the homeowner and it offered a very closed and claustrophobic feeling while in the kitchen. This beautiful Ponte Vedra home received an all too-needed update. A lack of space for countertops led to the installation of a large and gorgeous kitchen island. The matching countertops also blend beautifully with the accent backsplash above the range top. Outstanding white cabinets and oil rubbed bronze appliances round out what became a breathtaking kitchen!